Efficiently manage all sales, support and customer service inquiries without becoming overwhelmed. This open source, web-based help desk system includes remote desktop sharing, a knowledgebase application, live chat, service level agreement functionality, and many other impressive features at an affordable price. Use the platform to keep your business organized and customers satisfied. When your customers have a question, they will have the ability to contact your support team directly through the iScripts SupportDesk system. Create your own departments, assign staff members, and use the workflow and SLA functionality to ensure quick response times. Charge users for using the help desk system. Users can be charged for these services outside of the system; such as during their original transaction, offsite, or through another method. Internal IT departments will greatly benefit from the software's built-in live chat and remote desktop features. If you offer hosting or other technical services to clients, you will have the ability to aid them in processes by viewing their desktop, instructing them on the next steps to take and speaking with them directly. This customizable, open source script comes with a number of rich, built-in features to keep yourself and your staff organized while satisfying your customers. Users submit tickets by email or web form and receive an email when the ticket has been updated or closed. Communicate with your customers in a number of ways including remote desktop sharing, ticket creation, live chat, a custom knowledgebase and news section. Use the integrated workflow and service-level agreement features to ensure organized and timely support. 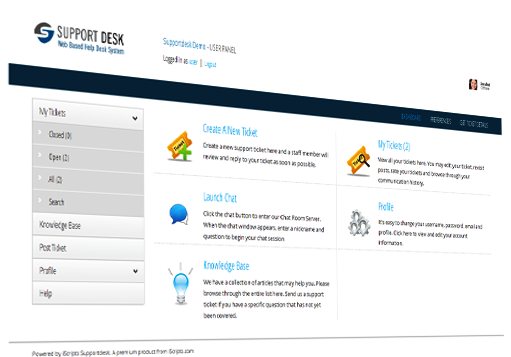 iScripts SupportDesk is a scalable and stable software offering everything you need to sufficiently handle customer service efforts for your business. Programming experience is not required in order to use this system. After your one-time purchase, the script can be installed on your server to begin providing excellent customer service and solutions. From this point, you have complete control over the script and your site as the site administrator. This is an open source script without code encryption which means you may customize the site at any time in order to fit specific site needs. Integrate the iScripts SupportDesk script into an existing site or create a standalone full-featured platform. This script is implemented using PHP and Flex with a MySQL backend. Organizing customers, contact information, questions, trouble tickets and issues can become quite difficult for businesses and IT departments. As the site administrator of iScripts SupportDesk, you will be able to configure site operation as well as add your company logo, content, and existing client information within minutes. If applicable, your staff members will have a login for easy access to the platform in order to respond to and address tickets. Users can submit tickets quickly by supplying their email, or by completing a thorough sign up process. Once installed on a server and domain of your choice, iScripts SupportDesk can be quickly set up to support your business. Customize the software to support staff members and specific departments (such as "Sales" or "Support"). You can also add your own labels which will define the subject of a ticket by detecting specific keywords. Users can login to their account to access a built-in knowledgebase system or submit a ticket. To accommodate customers, questions can also be submitted quickly by bypassing login and supplying just an email. You determine which staff members are assigned to tickets, departments and keywords. Along with this, the service-level agreement feature will ensure that all tickets are answered within a specified amount of time. If not, the ticket will be automatically escalated. If you decide to change or add any features to your help desk system, you can contact the team at iScripts or use your own PHP programmer to directly modify the software. Our unique help desk software possesses advanced and impressive features sure to enhance your response time and organization, while also keeping clients completely satisfied. Streamline your support efforts and efficiently manage your business by using the software's comprehensive built-in features and processes. Rather than spend a large amount of time, money and resources creating a support desk system, iScripts SupportDesk allows you to provide quality customer service within minutes for an affordable price. Choose to generate revenue by offering support services to your existing clients. Your help desk will support an unlimited amount of departments, staff members, tickets and users. Stay organized and ensure consistently quick response times by utilizing built-in features such as labels, service-level agreement functionality, workflow management and more. Ensure your customer support is effectively carried out using live chat and remote desktop sharing capability. Make the process convenient for your users by offering a quick and easy sign-in and ticket submittal process.